Boil sugar and water along with cardamom powder in a heavy bottomed pan and keep aside. Meanwhile, knead the chenna till it becomes smooth and when u roll, it makes a perfect ball. 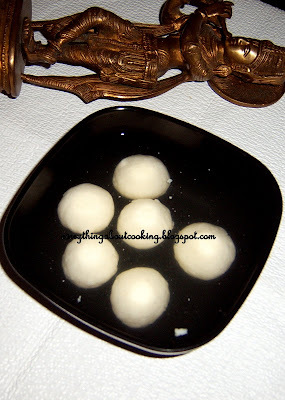 Make small marble sized balls(they will double in size) and slowly drop in the boiling sugar syrup.Cover and cook for 10-12 min on low heat,turning once in between(u will see that they have doubled in size). Add rose essence just before turning off the stove.Remove into a bowl carefully along with the syrup and set aside to cool.When cool refrigerate for atleast 5-6 hours.Serve chilled or room temperature. Enjoy!!! 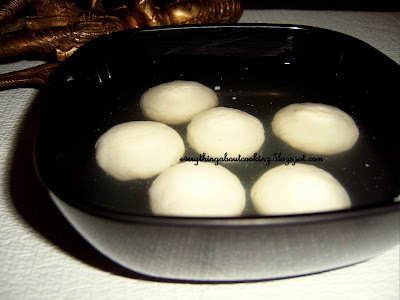 Note: Rasgulla can be stored in the refrigerator in an airtight box for upto 5 days. Oh one of my favourites! Thanks for sharing. The one that I saw in some Indian store are slightly brown color. May I konw what's the difference? ALL THE MEASUREMENTS USED IN THIS BLOG ARE TO THE TASTES OF MY FAMILY.DO CHANGE THEM ACCORDING TO YOUR TASTES.